Im fairly new to magic lantern, i started using it mostly for raw video and atm im using 10/12 bit raw video version. - in crop mode x5 with global drawing on i can see low res preview, BUT when i start recording it stops updating and freezes (tho i can push button to disable global draw but you cant really shoot that way and constantly pressin it ), is there a workaround for this ? i didnt try other builds tho, cause i wanted 10 bit option so i can record longer in max res. In ML menu, in the MOVIE tab under RAW video menu, there is an option called preview, there are 4 settings, auto/real-time/framing/frozen. Most of the time I use the setting real-time, if i want to see framing, I use half shutter press, this shows the slow ML preview with the right framing, if I'm sure about the framing I'll let go of the half shutter press. You can even use half shutter press during recording. I have been testing different filming modes in terms of aliasing/moire/false color and discovered an interesting thing. I've been using the latest Danne's build for the 6D with the SD hack. - If I film in x10 zoom my camera films without any crop an almost full sensor readout, just like in 'no zoom' mode (the captured region is shifted on the sensor), but unlike filming in 'no zoom' mode, which produces quite a lot of false color pixels (I've been testing this by filming very contrasty scenes with lots of small details, like trees against sky/white roofs), filming in x10 zoom produces the same angle of view but with a lot less visible artifacts in a form of falsely colored pixels. First time I discovered this I thought it was some kind of mistake on my part during filming, but since then I've repeated the test 2 more times and every time got the same result. Even asked my wife and she confirmed. It's hard to quantify what I see but it seems there's only about half falsely colored pixels I see in x10 zoom mode. I can't see why it would be like this, because the binning is the same as long as it's the same area readout, right? Also want to share my discoveries re what lenses to use in x5 crop mode. I'm sorry if it's common knowledge around here, I'll put it here just in case. I've measured the crop we get when we switch to x5 zoom mode. It's pretty much exactly x3 crop comparing to 'no zoom' mode (I'm comparing 1824x1026 resolutions in both modes). This is a heavy crop and brings a question - what lenses to use to get a wide field of view? After quite a bit of thinking and reading/watching around I discovered that probably the cheapest and easiest way to get a usable wide-ish angle zoom is to use the 10-22 EF-S lens. Apparently in can be easily modified to work on our FF body (it took me 5 sec last night - just pull out a piece of plastic from the back of it). So, this lens in x5 zoom mode gives a very usable 30-66mm range, it can also be used in FF mode - starting from ~14mm it doesn't vignette. So, you get 14-22 in FF mode and ~30-66mm in x5 zoom mode. If you switch to higher res in x5 mode (the highest continuous I was able to record so far is 2000x1124), your crop is reduced to ~2.75, giving you ~27-60mm equivalent field of view with this lens. This also makes an interesting point. I imagine it would be impossible to get a wide angle on crop sensor cameras in x5 zoom mode. They would introduce a 1.6 crop on top of 3 times crop of FF sensor, making it a huge 4.6 crop. So, even the widest 10mm lens available would only give you ~46mm equivalent angle of view on the wide end. Thx for answer, unfortenatelly i did have those settings for focus box but no matter what i set it just ignores it completely. Also did i get it right, you cant see ML preview even in low rez WHILE recording ? cause i tried all those also and i allways have eather no preview or frozen frame while recording. What is the most recent update for the Canon 6D? and read text below "Main Builds". The name is misleading, since there is no 4K option for the 6d. But this build has a big advantage over the standard nightly build: Lossless raw compression option, with also lower bitrate options (14 bit lossless, 12 bit lossless and lower). This looks fantastic and I am eager to try these out. Thank you very much for all your hard work! Question: What is the highest resolution setup for the 6D that avoids moire but also doesn't require using 5x crop. They seem mutually exclusive. So much information scattered across the forums it's hard to tell. From my understanding 5x crop can avoid the moire but will be cropped into a small portion of the sensor thus cutting your field of view down significantly. I am shooting real estate and was quite happy with 1826x1026 at first but certain fabric patterns give bad moire in the post workflow. I need to keep my wide field of view so doesn't sound like 5x crop will be an option. 24fps is acceptable but 50/60 would be ideal for slowing / smoothing motion. Aaaah, actually the fish-eye trick is a good one. I was already doing sometime similar with my 70d for some other use cases. Not sure why I didn't think of that Will have to try it out. Not sure if the math will work out because I want to maintain at least a 20mm field of view and have a 12mm fish-eye so if it's literally 3x smaller field of view that will put me at about 36mm FOV? My main goal right now is real estate videography so what I would really like is the highest resolution for 10+ seconds record time @ 60fps in 16:9. To be honest I'm getting a little fuzzy on the best way to accomplish that based on all the various presets and ML options. The best settings I came across so far, I think, mentioned needing to stretch by 1.67x in post but the video seemed to be cropped vertically so I wasn't getting the vertical field of view I needed. Honestly unsure how to stretch in post or if that would help. When I open the files in post (MLV app, ColorCast, etc) they don't appear distorted but they are definitely in a 2.35:1 (-ish) aspect ratio and have lost a lot of vertical resolution. Suggestions on how to accomplish the real estate setup above? My main goal right now is real estate videography so what I would really like is the highest resolution for 10+ seconds record time @ 60fps in 16:9. The readout speed of the sensor in the 6d isn't fast enough for decent quality 60fps in 16:9. Could be done with the trick Canon does in 60fps, skipping some more lines and stretch the video vertical with factor 1.67, but the moire is really bad and end result is rather soft. Without the need to stretch the video, the max resolution in 60 fps is 1688 x 754, if you want to use that mode for 16:9 aspect ratio raw recording, you end up with 1340 x 754 @ 60fps. The moire in raw video is really bad when using wide-angle / fisheye lenses. But you can fix a lot of the moire in post. Best option, in my opinion, is to stay in 1824 x 1026 resolution and try to fix the moire as much as possible in post. 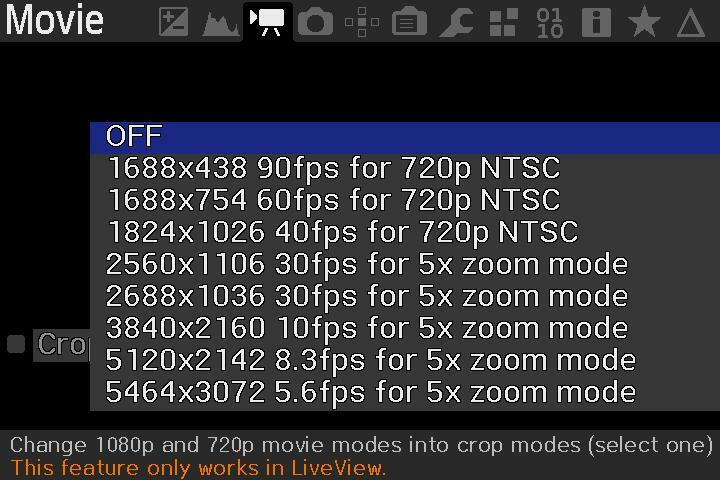 60 fps is not possible, you can however have 40 fps in 1824 x 1026 resolution mentioned with the crop_rec module you mentioned, so this makes a little slow/smoothing possible. Now how to fix (color) moire in your videos. I don't know what you are using now for post process, but most convenient workflow at the moment is probably MLV_App. To fix some color moire, you could try setting debayer algorithm to LMMSE instead of the default AMAZA debayering. And try some chroma smoothing, 3x3 or 5x5 option. A bit more time consuming, but gives you best results, you can proces your MLV files to DNG files with MLV_app. After that you can proces the DNG files in RawTherapee and export as a TIF files, which are recognised as a video sequence by many video editor software. This is basically the same conclusion I came to. If I move slow and cleanly 30fps isn't a big deal. I have a gimbal and once I practice more I should be able to get very smooth footage with little to no stabilization or slow down needed. The methods to get 60fps just have too big of an impact on image quality and workflow and thus aren't practical in the end. MLV App is what I use already so good to hear that's one of the better options for post. I no longer have the test .mlv file that showed the really bad moire (just the exported DNGs) so can't compare LMMSE but in other less problematic tests I could see no difference between that and AMaZE. I did try RawTherapee briefly but found the interface cumbersome and poorly suited for a quick workflow and the results worse in other areas compared to my DNG process in Lightroom. Overall RT seemed similar to the whole 60fps thing. Gave benefit in one area but poorer results in several others. Will have to try the crop_rec 40fps again. I've had stability issues with that version of crop_rec and it seems easy for live view to go glitchy and corrupt the signal. Also considering HDR video which has pros / cons like 60fps but there are people who seem to be using it quite nicely for real estate. It's a bit more washed out by it's nature but I think I can add some contrast and punch back in post. Really appreciate the help. Even though I'm not getting the results I hoped for (and it really makes me want a 5D III or a Black Magic Pocket Cinema) it's still better than the default Canon video and we can only spect so much from this kind of hacking. Lucky to have it at all! PS: What's the recording limit for 40fps @ 1824 x 1026 and does it require the presets or can it be configured with the original crop_4K build? So, I get where you're coming from on those comments but as per my previous comments none of those things will suffice and / or are already being done. While I wholeheartedly agree that "fix it in post" is never ideal, sometimes there is no other practical option with the given resources. I cannot shoot in crop mode due to the wide field of view that I require (as per previous comment) and at this time I am not willing to add a super ultra wide lens like an 8mm fish-eye just to keep a wide enough FOV in 3x crop mode. Even then it would be a little tighter than I'd like and most likely would have a lot of distortion. Fully aware of the 6D (and most other Canon bodies) limited write speed. As per previous posts I'm already getting sufficient record times for this use case at 24 and even 30 fps in HD resolutions. So, that's not an issue at the moment. The GoPro suggestion is interesting. I have a Hero 4 Silver and tried it in 1080p @ 60fps Linear mode (to remove distortion). It's ok but dynamic range isn't nearly as good, shadows have lots of noise, exposure control is limited, etc. A newer model would surely do better but I don't plan to drop $500+ on a brand new one. We know there are probably better options out there. But the situation here is like: I want to achieve something like ... and this is my current camera, a 6d. With 40fps you lose the standard Canon liveview, and recording times are probably less then 10 seconds, more like 5 seconds I guess. And with the use of a gimbal to smooth things out, I should definitely stick with standard 30fps, so you keep good working live view and don't need to use the crop_rec module. I never used HDR, but I doubt if it is worth the trouble in post proces, especially on the 6d. The 6d has very clean shadows compared to the other Canon DSLR's, and raw recording gives you plenty of dynamic range. I see you're using Lightroom to edit the DNG's. I like Lightroom too for my photo's, really easy to use and I achieve best looking colors in Lightroom. But for raw video(with lineskipping), it's not that good. Magic lantern raw video in Lightroom gives lots of false color moire, plus you are losing much of the fine detail in Lightroom. Colors and exposure and noise reduction handles all really good in Lightroom, but it is very bad in keeping fine detail. What you could try is import the DNG's in RawTherapee, do a basic exposure and white balance adjusment, set LMMSE as debayering, maybe activate the defringe option, for all colors (see the youtube video) and export it as 16 bit TIF files. Now open these TIF files in Lightroom, and do further adjustment. So your basically getting best of both worlds, better debayering and less color moire from RawTherapee, easy to use interface and good color and noise reduction from Lightroom. I no longer have the test .mlv file that showed the really bad moire (just the exported DNGs) so can't compare LMMSE but in other less problematic tests I could see no difference between that and AMaZE. If you want, you can share/upload one of these examples of really bad moire DNG's. I'm curious what results are possible and do some compare tests, with Lightroom, RawTherapee and using both options together. Interesting suggestion on the RawTherapee > Lightroom workflow. I will have to give RT another try. I forget which other problems RT seemed to introduce but perhaps running the TIFFs through LR after can resolve them. Hmmm. Very appreciative of the help. Thank you! Found the culprit of the Moire in LR on those pillows. It was sharpening. ... it seems to completely avoid the moire, for this particular case. Of course that also reduces the overall sharpness quite a bit compared to what I wanted but I'm sure with more playing I can get a reasonable compromise for these cases. Edit: Here is a video comparison of the before (bottom) / after (top). A few frames in the adjusted version still show some artifacts, but that can probably be smoothed too. Those frames have different / more artifacts than the one I was using as my base, apparently. Now that the pillows are sorted I see other areas jumping out at me like the TV stand and some colour weirdness on the stitched edge of the back pillow at the beginning. I think these are mostly extreme cases compared to other shots I've done so far. It is definitely handy for controlling the "spill" so to speak. Downloaded your files and take a look at it. Cool, in Lightroom I can see your settings, the DNG files contain your Lightroom settings. Sharpness setting is indeed a little bit much for my taste. Took the files in RawTherapee and LMMSE debayering removed most of the color aliasing on the pillows. Also used the defringe setting on all colors (like explained in the youtube video), now when I set debayering back to AMAZE, the color aliasing doesn't get much back. So in this case, only the defringe option for all colors probably is enough to get rid of color aliasing, but to be sure I kept using LMMSE as debayering. Furthermore I set the white balance in RawTherapee and got the highlights back in the exposure settings. The image now still looks a bit dark in RawTherapee, but you could fix that in Lightroom or choose to bring the shadow slider down in RawTherapee to get a more bright room. So now I have two options to use as a base in Lightroom. Now I've edited one of these TIF's further in Lightroom and tried to get something identical as you created in Lightroom. I've also uploaded the recipe file from RawTherapee, if you put this file in the same directory as the original DNG and load the DNG in RawTherapee you can see the settings. These recipe files just have the filename of the dng and the extension pp3 on them. It just contains the slider settings in RawTherapee for that DNG. Very interesting results. Thank you for tackling this! There are definitely aspects of the RawTherapee versions that look better (pillows) but certain things that don't look as good (light fall-off on lamp, colour cast and light falloff on window). Will give the recipe a try and see about adjusting the workflow overall in these cases. Side note: Increasing the Color noise reduction in LR can remove most of the color aliasing / artifacts with little to no impact on the rest of the image. I discovered that with another scene I had shot elsewhere that has strange artifacts due to a funky bed sheet pattern and it works decently well here too. The only side effect I've seen so far is it removes some saturation is areas that have only small patches of colour (like the spine of a book on a shelf if it's very small in the frame overall). Will be interesting to see how RawTherapee handles that same situation. Again very appreciative to have such great help in the community. Thanks! That’s the beauty of raw, many ways to develop the image, many ways to fix things. Sounds like you are already further ahead in discovering things that work around color aliasing. I can confirm that the Color noise reduction does help a lot with false color artifacts. I usually crank it to 100 and also lower the Detail to 0, if it's really bad. Yes, it does affect saturation a little, but the benefits far outweigh the cost, imo. The Defringe setting under Lens Correction can help with some artifacts too but proxy. Mostly I tried it to reduce some actual Chromatic Aberration similar to the defringe tweak in the RawTherapee video but it grabbed some other artifacts too with very little if any side effects.